Specialized-Lululemon lived up to expectations in today's world championships team time trial when the American squad crushed the opposition to defend the title they won in Limburg last year. Rabo Women Team rode a consistent race to take 2nd while Orica-AIS took 3rd. 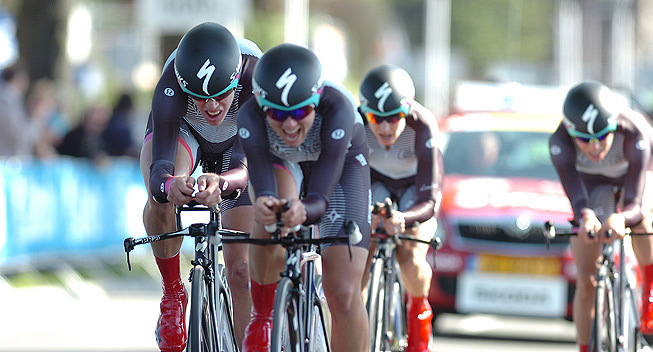 Specialized-Lululemon has been totally dominant when it comes to time trialing and the team was the major favourite in today's Worlds team time trial where they lined up as defending champions. Unsurprisingly, the sextet of Trixi Worrack, Eleonora Van Dijk, Evelyn Stevens, Carmen Small, Katie Colclough and Lisa Brennauer crused the opposition and defended the title they took at the inaugural running of the event in Limburg last year. The team posted the fastest time at both intermediate checks and kept extending their advantage all the way to the finish. At the first check, they were only 1,87 seconds ahead of Orica-AIS but at the second one, they had extended their lead to a massive 50 seconds. When they crossed the finish line as the final team on the course, they stopped the clock in a time that was 1.11 faster than the one set by Rabo Women Team. Last year's runner-ups Orica-AIS went out hard from the beginning as they tried to put the American favourites under pressure. Having been less than 2 seconds behind at the first check, they faded on the latter part of the course and had to settle for 3rd. On the other hand, Rabo Women Team rode a consistent race and improved from 3rd at both intermediate checks to a silver medal at the end. Rusvelo was the fourth team down the ramp and set a time that was far better than anyone else when they crossed the line. The team faced a long wait in the hot seat and led the race until only the three big favourite teams remained. In the end, the Russians had to settle for 4th while MCipollini Giordana took 5th. The world championships continues later today when the elite men battle it out for the team time trial title. Starting at 14.00 CEST you can follow that race on CyclingQuotes.com/live.